Book now for Spring and Summer 2019! Popular newly remodeled two bedroom, two full sized bathroom, non-smoking rental apartment is available in Leland. Within walking distance of historic Fishtown, beaches, galleries and marinas. Only 3 blocks to North Beach, Nedow's Bay Beach, Van's Beach and South Beach. 7 day minimum rental. Long term rentals also available. Children are allowed. Two bedroom apartment with queen size beds, large bathrooms with shower and vanity areas, dining table, microwave oven, toaster oven, full size refrigerator, dishwasher and kitchen area. Open floor plan. Everything is new and clean ! Also includes access to a washer and dryer. Rental includes garage space for one car and one outside parking. Strong WIFI is available in the apartment. Cable TV is not available, however a 32” Smart television with Internet access (including YouTube) and NetFlix is available. You will love this place with wonderful designer accents and lots of space to relax. Leland has lots of fun water sports - fishing, kayaking, paddle boat rentals, boating, swimming and sight seeing. Manitou Island transit is within walking distance of the apartment - take a day tour to South Manitou Island, backpack North Manitou Island, climb the South Manitou lighthouse, hike to the ship wreck: the Morazon, hop on a wagon tour to the giant cedar trees, hike the farm loop circa 1850, climb the dunes and view wildflowers, cruise through Good Harbor Bay. See miles of hiking and secluded beaches. Scenic golf course is also within walking distance. Restaurants, coffee and snack shops line Main Street among local retail stores, galleries and The Mercantile grocery store. The Verterra, a Leelanau Peninsula winery, has a tasting room and retail store in Leland which is within 4-5 blocks of the apartment. Leland has everything you need for a perfect, relaxed vacation or an adventurous getaway. I am the property owner that resides in another house on the same lot. I also live in Indianapolis. I have a property manager and a maintenance team that keeps this property in excellent condition. This is a wonderful rental opportunity in the middle of Leland Village. All the main attractions are within walking distance. This rental has all new furniture and accents. Great location that is within walking distance to everything that you need for a fun vacation. Over 1200 square feet in this rental with a new bed, couches, TV/DVD Combo, furniture and appliances. Includes a microwave oven, toaster oven and Keurig coffee maker. Within two blocks of Main Street with The Mercantile grocery store, restaurants, coffee shops, galleries and shops. The location is incredible! There are no stop lights in the Leland village. Very relaxing, rural setting. Beautiful walking and biking paths. Located in the heart of Leland village. GREAT location. Leland Golf Club is within 3-4 blocks of the apartment. Very nice rural golf course. Within three blocks of North Beach, South Beach, Van's Beach, and Nedow's Beach. See photos for more details. Within walking distance of Lake Michigan. Incredible central location. Walkers paradise. Michigan is a ski destination for many people and becomes a winter wonderland during the snowy, winter months. Within 2 blocks of historic Fishtown, multiple marinas and four scenic beaches. Everything is within walking distance of the apartment. Rental kayaks & paddle boats are available in the area. 32" Smart TV available with NetFlix and internet access available. Local TV reception and cable TV are not available. Several DVDs are available to borrow or feel free to bring your own DVDs. Perfect guests! Welcome back anytime!! 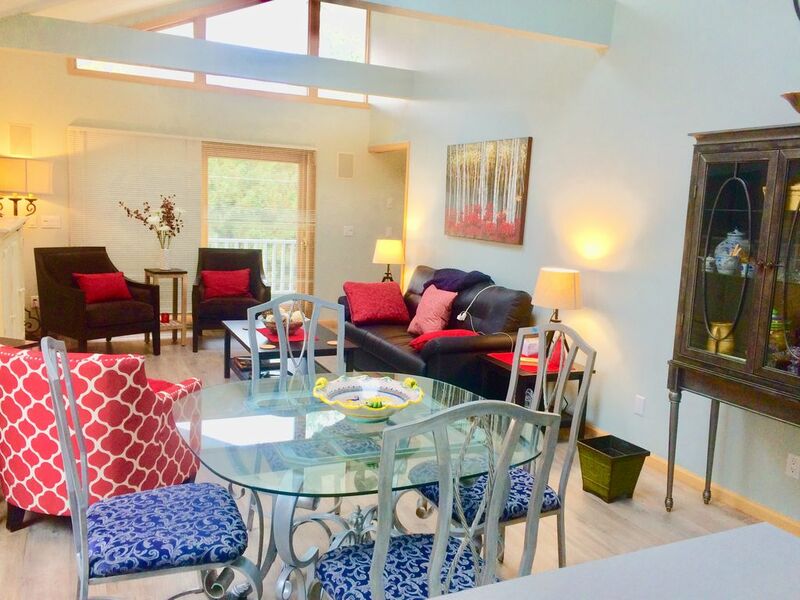 Central to everything and steps to Lake Michigan and Lake Leelanau! Our hosts were extremely accomodating and gracious. Best town on the Peninsula by far. Would recommend to anyone who loves outdoor adventures, wine tasting, or simply watching the waves crash on an unbelievable coastline. We will be back! These guests were wonderful, and left the newly furnished and decorated rental unit exactly how it was when they arrived. Super nice people who enjoyed the apartment's amenities and it's easy, central location to the pleasures of this beautiful village and region. Historic Fishtown, galleries, coffee shops, grocery store, shopping, multiple restaurants, friendly local village with incredible lake views and sunsets. Rental is in the middle of everything!